When a city has as much history as Seattle, there’s bound to be some ghost stories. And with subterranean ruins, passages, and plenty of sordid history, it’s the perfect place for an Underground Paranormal Experience. Eric Olinsky is a professional tour guide for Bill Speidel’s Underground Tour. Having started off leading history tours in Washington, DC, he moved out west to Seattle. A great storyteller, especially where history was concerned, he got a job leading the daytime tours. 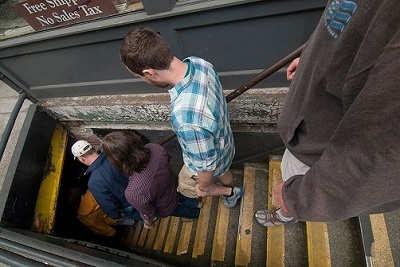 Soon, he was given the additional the task of leading the Underground Paranormal Experience, guiding visitors into the spooky depths of Pioneer Square’s subterranean remains in search of ghosts. While not as detailed as the daytime tours, Olinsky does make sure visitors get some history for context. After the Great Seattle Fire in 1889, the new city decided to rebuild on top of the ruins of the old, with the remains of shops and streets used as storage and ways to get around during reconstruction. 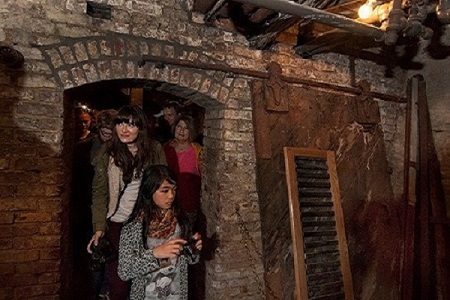 In 1907, the underground passages were condemned in 1907 for fear of bubonic plague and became the home of prostitution rings, gambling halls, speakeasies, and opium dens. For Olinsky, being a guide for the Underground Paranormal Experience has been a bit of an eye-opener. “I accept that there are things that have happened that I can’t explain with anything scientific, though I’ve tried. I’d say I’m still on the skeptical end of things, but it’s hard not start to believe.” Still, he says whether people believe in ghosts or not, the most important things is that the tour is fun. From witnessing unexplained phenomenon to an excuse to belt out the Ghostbusters theme song, it’s certainly an experience worth checking out.